The knotting of a rug is based on centuries of tradition. Thus, different knotting techniques have been developed across the different regions. Basically, four different knot types can be distinguished. The symmetrical Knot is robust and originates from the Turkish area. The asymmetrical knot allows a denser knotting and is also called Persian knot. There are also Jufti and Tibetan knots, but these are now called are less widespread. An experienced knotter crafts 10,000 knots per day on average per day. The knotting itself is usually done by women working on their own loom at home. Thus, the crafting of a fine carpet with 500,000 knots per square meter and an area of 6 square meters (3x2m) takes about 300 working days. This gives an idea of the manual effort required for a handmade carpet. In this context Persian rugs are still very cheap. A comparable Nain 9La (3x2m) with almost 500,000 knots costs only slightly more than 3,000 € in sales (price reference: Nain Trading), despite its over 300 working days of production time. 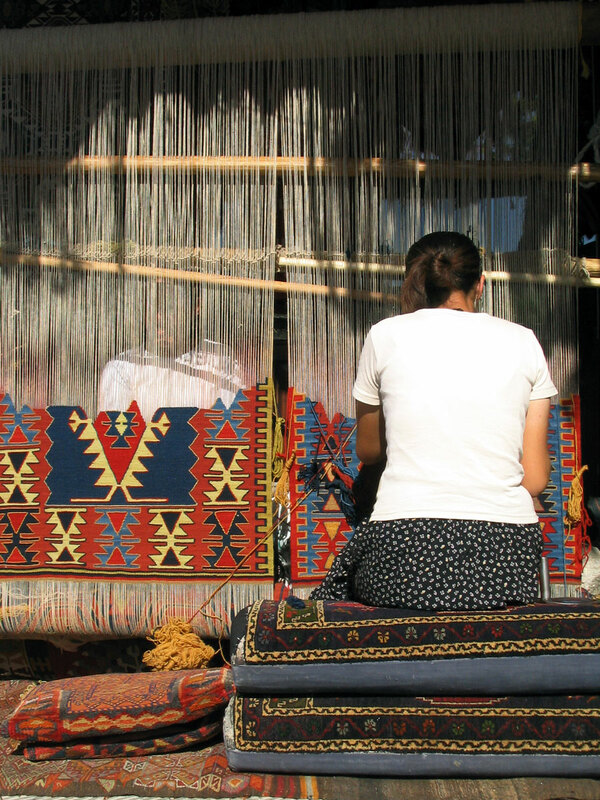 The knotting density is an important indicator for the effort of a handmade carpet. It is measured per square metre and also provides information on the fineness and durability of a carpet. Very coarse carpets start at around 50,000 knots per square metre, while the finest carpets, such as Tabriz 70Raj, have a knot density well over 1,000,000 knots per square metre. Such pieces are made by highly experienced master knotters and are also interesting for collectors. The knot density of a carpet can be quickly estimated with the help of its reverse side. The number of knots is multiplied by one hundred over a length of one centimetre and then squared. The result is the approximate knot density per square meter. It should not be forgotten, however, that the number of knots can vary with knots running up and sideways and is not always the same across the carpet surface. After knotting, the rug is finally cut by the loom and finished for the next step - trimming or polishing. Here you will find a few examples of exclusive Persian rugs which were particularly elaborate in their knotting and with a knotting density exceeding 500,000 knots per square metre could only be made by experienced master knotters. Such pieces take more than a year to produce for a single weaver and therefore have a certain rarity value. 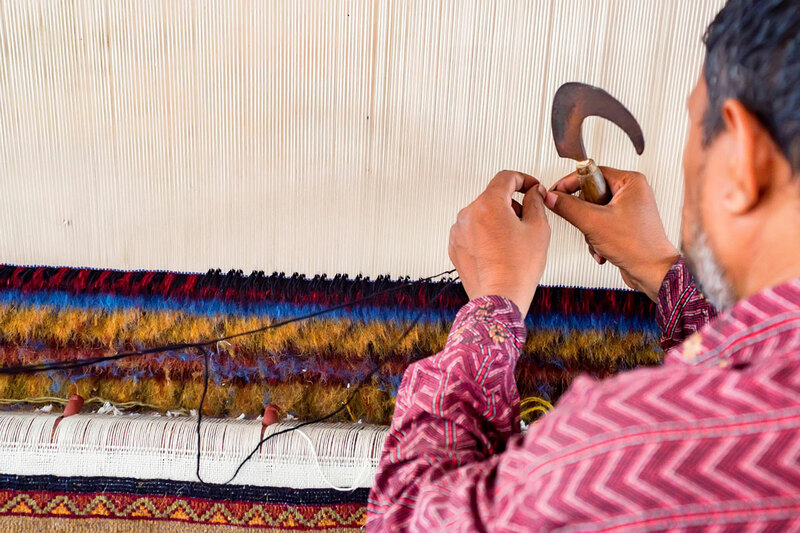 Weaving a rug is fundamentally different from knotting. Kilim carpets, for example, are woven. It is believed that the first carpets were woven many hundreds of years ago, and that the first knotting techniques were developed on that basis later on. Woven rugs are much less elaborate than comparable knotted rugs. In addition, weaving only permits straight-line and geometric patterns, so that detailed figurative patterns are not can be achieved. Most woven rugs are much lighter and have a shorter lifespan.